Kampot is known throughout the region as the producer of the best pepper in Southeast Asia, perhaps the world. 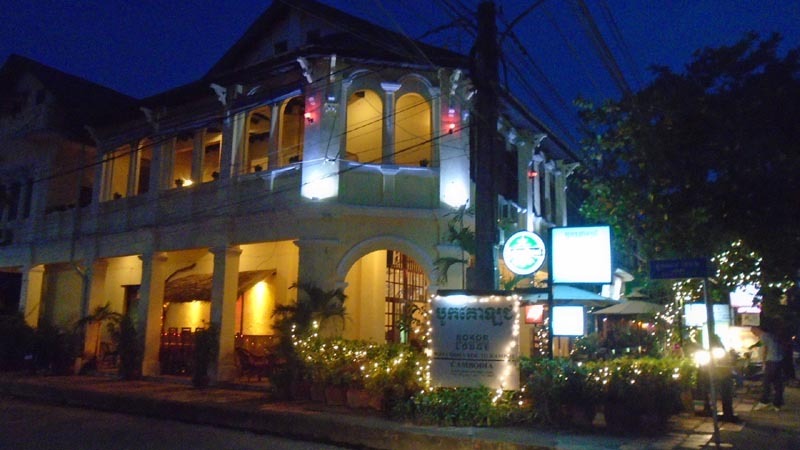 It is said that no self-respecting French restaurant worth its Michelin stars will be caught dead serving a non-Kampot pepper in their Peugots (the Rolls Royce of peppermills). 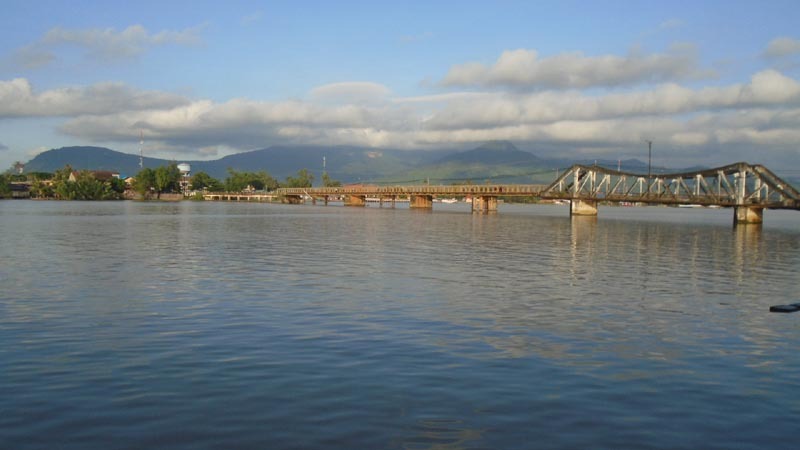 Geographically, it lies along the Kampot River with close proximity to the sea. The river bank on the east side is lined-up with restaurants, shops and guesthouses. It's the more animated part of town. Vietnam is only an hour away. This town felt good. The energy was spot-on. 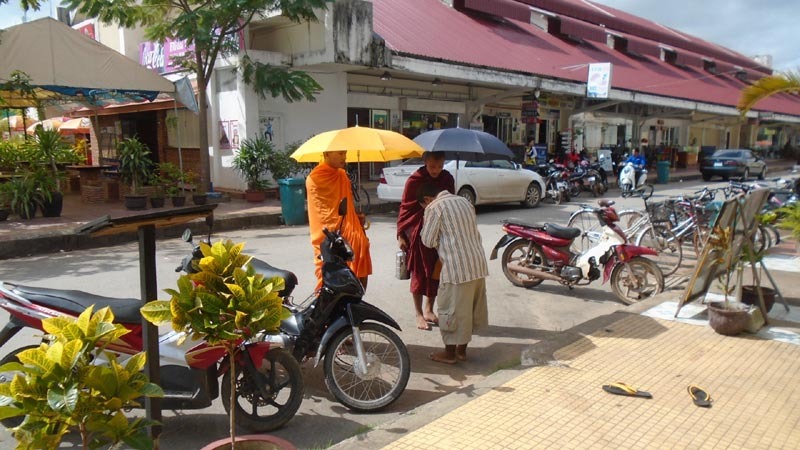 I was reminded of Battambang - another quaint town along a river bank where life moves at its own leisurely pace. 3 nights in Arcadia was enough for me. It was time to move into town and see what's happening. 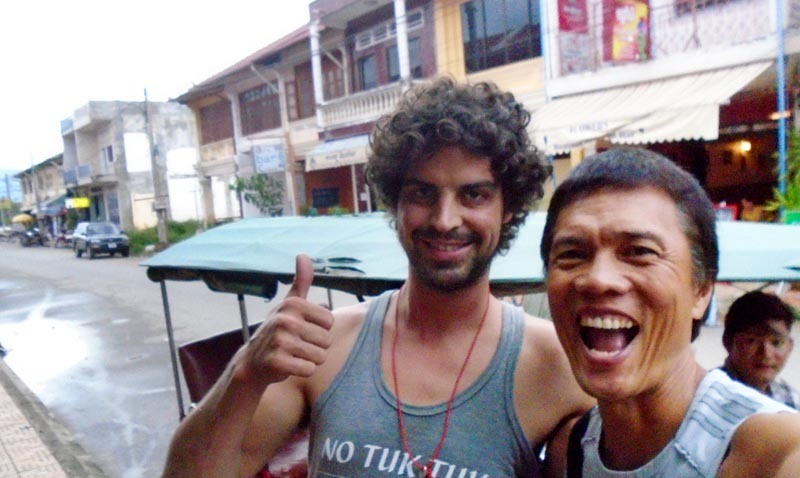 I was dropped-off by the tuk-tuk in front of Titchs Guesthouse. I remember it as one of the recommended places by Lonely Planet. Oddly enough though, no backpacker mentioned the word - it was always Mad Monkey or Arcadia Backpackers. I would have checked-in at Mad Monkey, but I was looking for 'me' time where things are more quiet. Titch was surprisingly clean, cheap and empty. At $3/day, I had a bunk bed in a dorm that was all to myself. It had an open roofdeck that offered an unobstructed view of the river. Trish, the hands-on owner, was quick to address hotel issues (like clogged drains) when her attention was called to it. 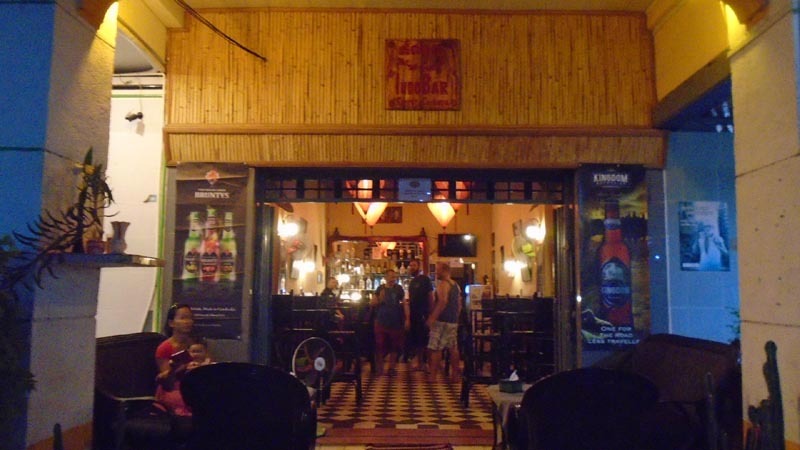 This place is probably the most under-rated guesthouse in Kampot! 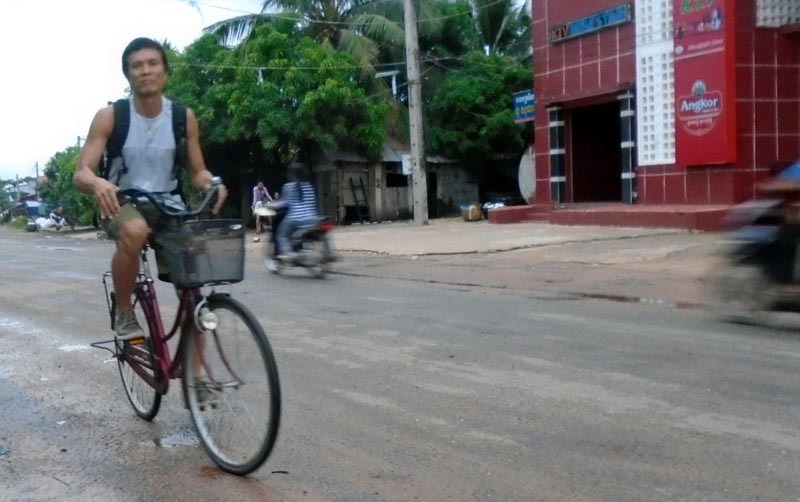 Cambodia hammers down to visitors the grim history they just went through. Regular movies are shown around touristy areas (Battambang, Siem Reap, Kampot, Phnom Penh, etc.) about the atrocities of the brutal Pol Pot regime. At Ecran Movie place in town, I went to see Enemies of the People, with fellow backpackers Matt and Erin. The movie was about a journalist who gained the confidence of the Khmer Rouge killers (then in hiding or incognito) to get the true story of why the killings happened. Ultimately, the answers remained unclear - the killers were just following orders from the top without knowing the sense of it all. The remaining top leader, Nuon Chea, known as Brother Number 2, second in command to Pol Pot himself, defaulted into a non-sensible dogma of 'protecting the people' (2 million of whom he ordered killed), even invoking Buddha to wash his hands clean. He was last seen at the movie being air-lifted to face criminal charges. At the end, the whole slaughter of 2 million people never made sense either ideologically, strategically or tactically. Nothing made sense. It was pure mindlessness. 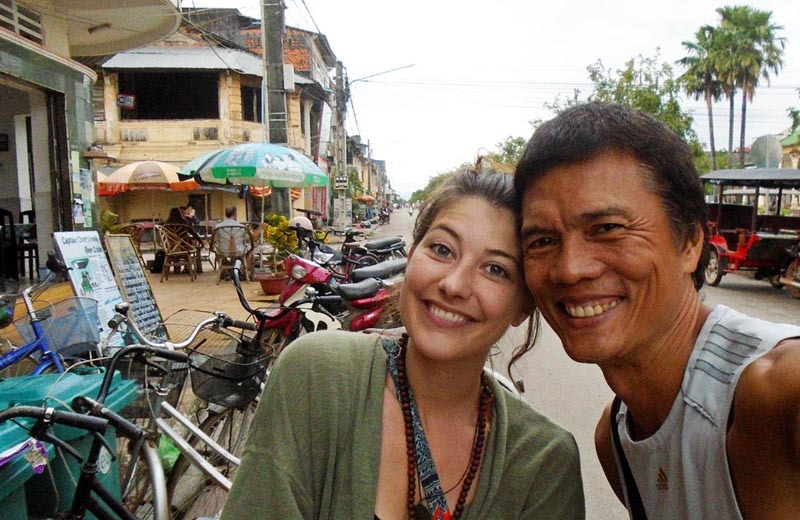 Cambodia lost 2 million of its best and brightest. We left the movie knowing a little more about the tragic genocide, and feeling heavy. Whew!!! 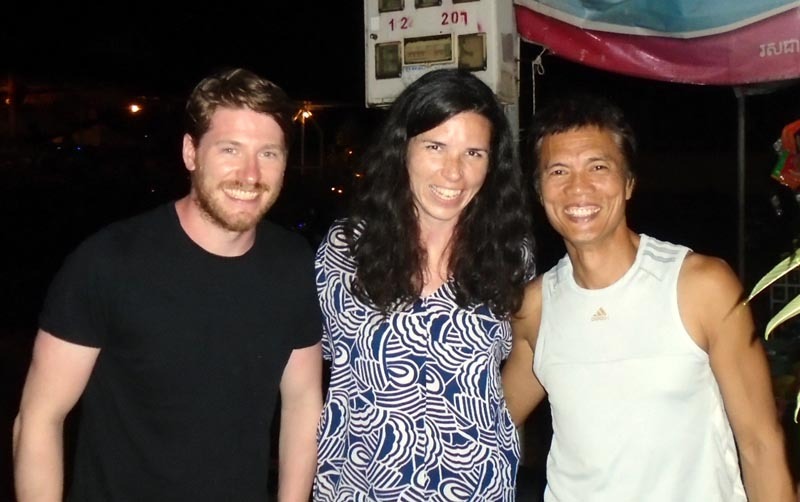 I got lucky being in Kampot when this happened. 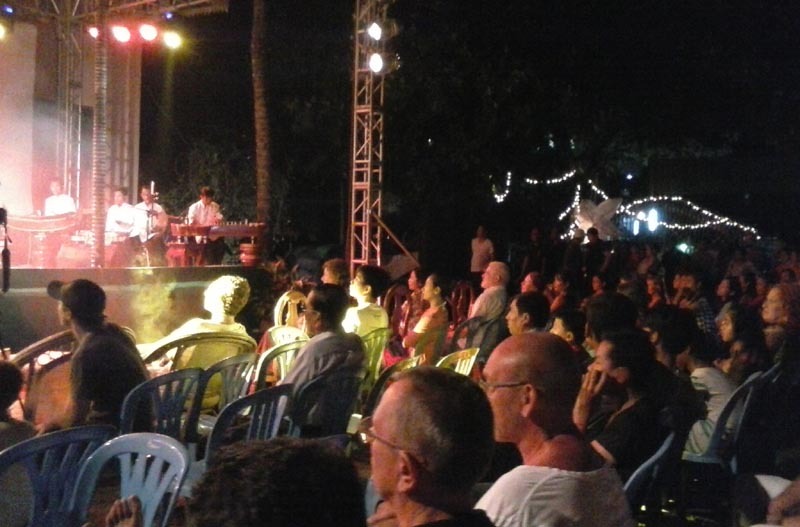 Dubbed the "psychedelic jungle cabaret in Cambodia" it's a rock musical stage play performed by the Kampot Traditional Music School and the Cambodian Space Project - featuring the vocal talents of Channthy Kak. She can sing Cambodian traditional songs and whip-up a version of House of the Rising Sun another second. 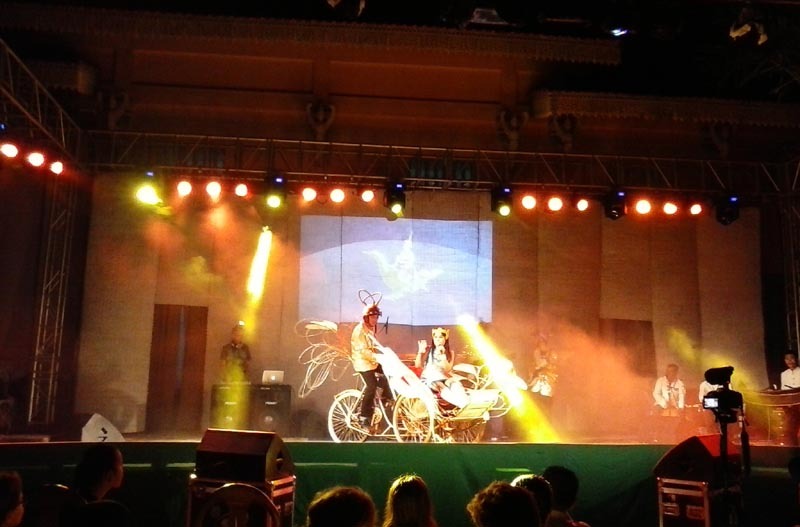 The story integrates Cambodia's roll and roll, science fiction, classical dance and Cambodian tradition. A must see! By donation, for the benefit of the orphaned and disabled children of Cambodia - give 'til it hurts! This one was memorable simply because it rained hard while we were heading out the river on a boat in pitch black condition. I was with a UK couple who haven't seen a firefly before so it was big deal for them. We went far out until we couldn't see the city lights anymore. It wasn't very pleasant as we were wet and cold. Finally, in a mangrove section, we saw a few...yes, just a few fireflies. I've seen better. But perhaps it was because of the rain. Tour fee, $5/pax. I can't say I tried all the restaurants in town, but here's where I frequented for value, taste and 'x' factor. Best value around for local Khmer cuisine. Breakfast starts at $1.25 for baguette and scrambled eggs. Try their seafood amok at only $3.75. Expats eat here which already says a lot. I also rely on them for tour and bus bookings - always reliable. 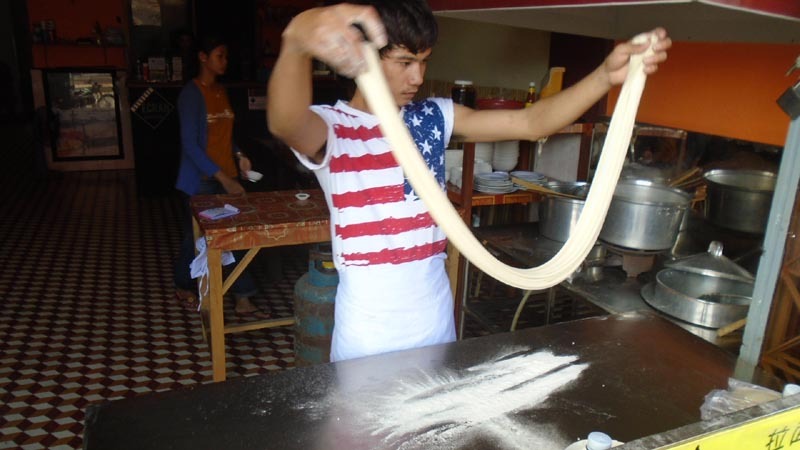 For as little as $2 of a meal, they will hand-pull noodle right in front of you. That beats Japanese Tepanyaki for value and showmanship! The taste is spot on as well. They also serve home-made dumplings. Try the fried dumplings! After 2.5 months on the road, I was already hemorrhaging cash. 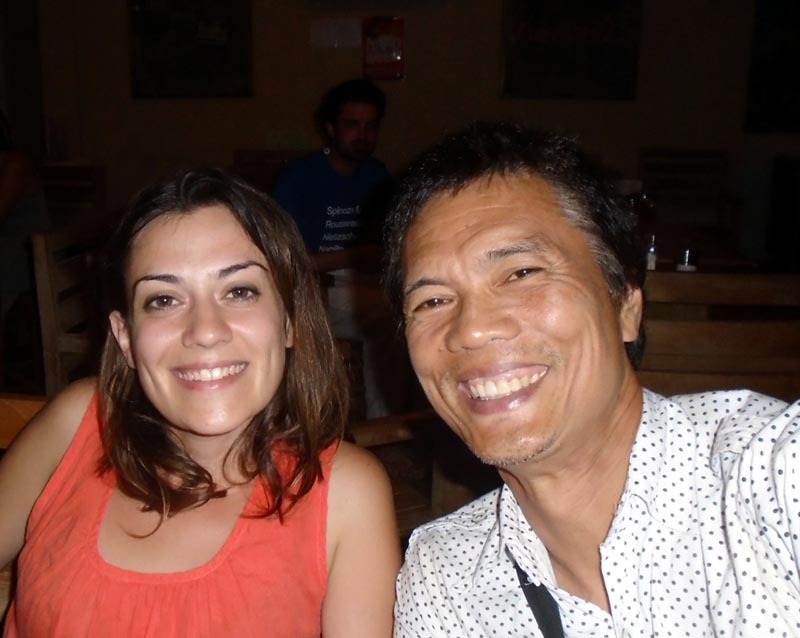 I tried to make my rounds in Kampot making deals but with only minor success. I didn't really feel like working - more like doing the motion as token for due-diligence. 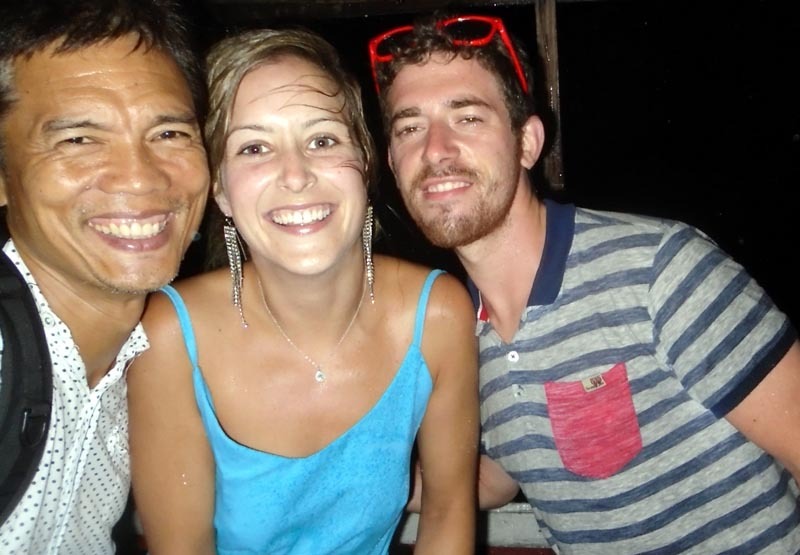 The whole 9 days I stayed in Kampot, I practically just chilled, not rushed by any kind of touristy attraction to be had. Kampot seems to be the place to just 'be'. For a nomad who left the comfort of 'home', I seem to make a home out of every destination I find myself in - and Kampot is dialed-in for that. 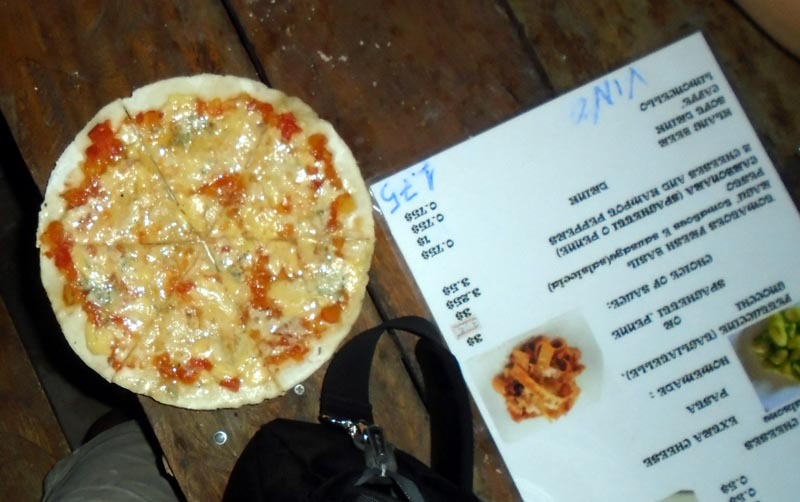 There were many offerings in Kampot, and I was lucky enough to partake of some. But if I were to choose a highlight, it would be the random social interaction I had with people - mostly fellow travelers I meet in my day-to-day. I would have loved to be interacting with the locals and hear their stories (specially their memory of the Pol Pot regime) but the language barrier was formidable. Kampot is indeed charming. It grows on you. This is one place I hope to keep coming back to. But with just 4 days before my visa runs out, I had to head to Phnom Penh before I leave Cambodia altogether for another country. But before all that, I have to check out the much talked-about Bokor Mountain and the crab cooked in pepper sauce in Kep.